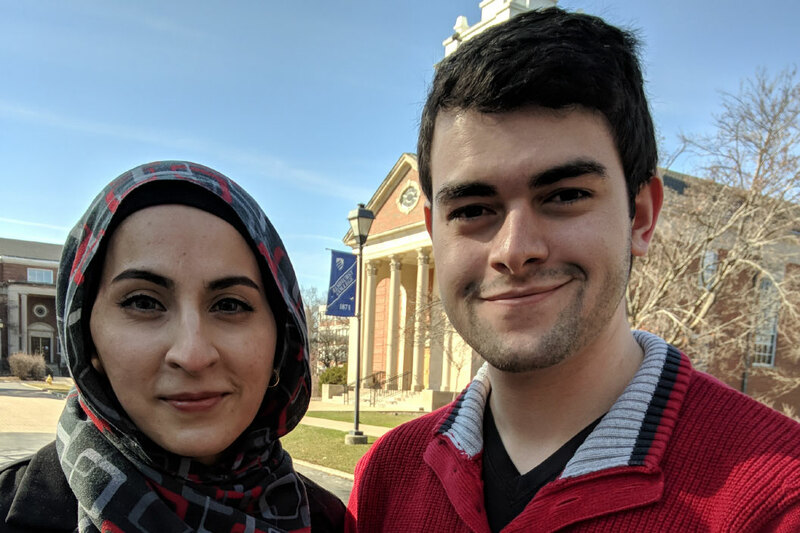 Elmhurst College and Illinois Student Employee of the Year Andrew Dufour ’19 with his supervisor, Saaema Aslam. The Student Employee of the Year (SEOTY) Recognition Program is a national contest created to recognize outstanding student employees who make meaningful contributions to their institution. Since 2010, more than 80 Elmhurst College students have been nominated by their supervisors for this honor. This year, Andrew Dufour ’19 was one of those nominees. His supervisor, Saaema Aslam, assistant director of systems and support in the Office of Information Services, nominated him because of his strong work ethic and can-do attitude. “The level of support, resourcefulness and service he provides exceeds all of our expectations. He has single-handedly managed the Help Desk when needed and is constantly willing to do more,” Aslam said. Nominations are submitted to a panel of Elmhurst College administrators who judge entries on each student’s reliability, quality of work, initiative, professionalism and uniqueness of contribution. After analyzing each nomination, the panel chooses one Elmhurst College student as the winner, and this year, Dufour came out on top. It was all a surprise to Dufour, a computer science major from Clarendon Hills. He found out this past Tuesday, April 17, at the Student Employment Enrichment Celebration, when Student Employment Coordinator Kathy Maxwell made the announcement. She said that not only had he won the Elmhurst College SEOTY award, but that he is the first Elmhurst College student employee to also win at the state level, as recognized by the Midwest Association of Student Employment Administrators. I really wasn’t expecting to be nominated, or to actually win. It was a complete surprise…but it feels good to represent the College to the entire state. Dufour has been working for the last two years as a senior student technician in the Office of Information Services, where he has a variety of daily tasks, including troubleshooting computer issues, configuring network and printer connections, and supporting the College’s computers, computer labs and smart classrooms. His contributions to the office have made a positive impact, and the relationships he’s formed with co-workers keep him going. “I love technology, so working here is being around what I love. But my co-workers make my job that much better. They keep me entertained and excited,” he said. As Dufour continues his work at the College, he will have his name added to a plaque in the Frick Center, receive a cash prize, a Beck’s Book credit, and a certificate of achievement to commemorate his accomplishments.